Watch Hill Firefighters were the recipients of the generosity of the students, staff, and families of the Meadowbrook Waldorf School in Richmond this morning. WHFD members joined over 100 firefighters in battling a large structure fire at the school last Sunday while providing mutual aid to the Richmond-Carolina Fire District. Today a group of students and staff delivered a basket of baked goods, jams, flowers, and handwritten notes to thank the firefighters for their efforts. We appreciate their generosity, especially during their time of tragedy! 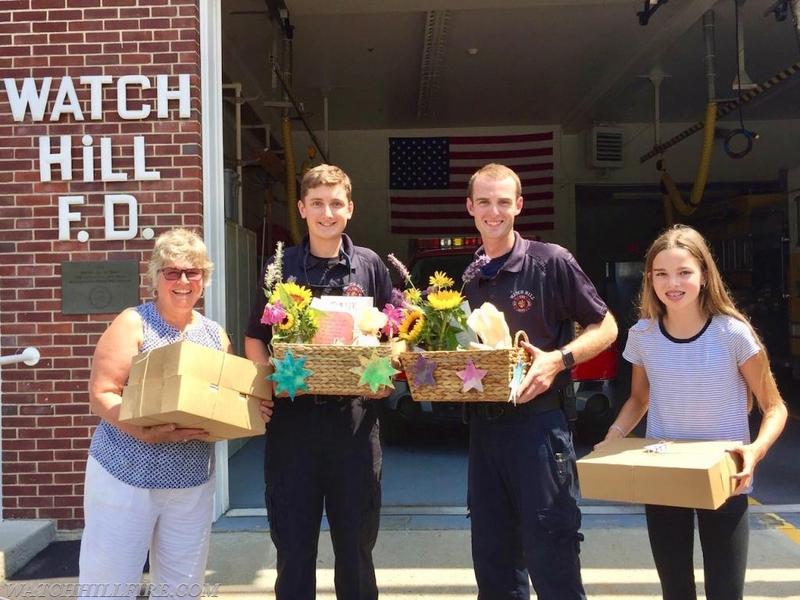 WHFD firefighters receive care packages from the students and staff of the Meadowbrook Waldorf School following a fire last week at the school. Many thanks to DC Simmons, LT Koretski and FF R.Harold for jumping to assist when the call for all-hands came in as well as the rest of the dedicated members of WHFD who remained within the district to provide coverage on a Sunday.